Tightening in production with different tightening strategies in torque and angle. Quality control tests by measuring the residual torque on the joints already tightened, with different detection methods. Data traceability with embedded barcode reader and wireless transfer to software / external databases. Test of all power tools and wrenches on the production line (Cm-Cmk and statistical control), with test functions (manual or automatic) and calibration, according to ISO 6789 and ISO 5393. Measurement of torque and angle produced by power tools. Results and traces are saved and transferred to remote databases. The bench FTY reproduces the real joint behavior, testing the tool in the same real condition of use. Portable analyzers that, connected to a torque or torque/angle transducer, perform tightenings, tests all types of power tools (Cm-Cmk) and measure the residual torque on joints already tightened (Cp-Cpk). Possibility of embedded barcode reader and wireless communication. - To be connected to torque analyzers or test benches. Transducers used directly on the production line to measure / calibrate power tools and torque wrenches. They can be connected to data acquisition systems or test benches. Freedom Positioning System uses ultrasonic technologies to detect the spatial positions of the tool on the production station. - Error proof visual procedures for rework stations. Definition of the tools archive, schedule of tests and generation of statistics Cm-Cmk, Cp-Cpk, control cards (SPC). Management of procedures for rework and production stations. 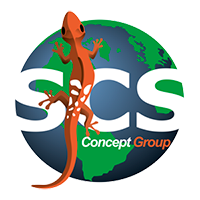 SCS Concept provides a mobile laboratory for calibration of torque and angle transducers, electrical calibration of amplifiers. Mobile laboratory for calibration of torque and angle transducers and electrical calibration of amplifiers.